The fourth novel in Tony Hillerman's Navajo Detective series and the first to introduce Sergeant Jim Chee of the Navajo Tribal Police. 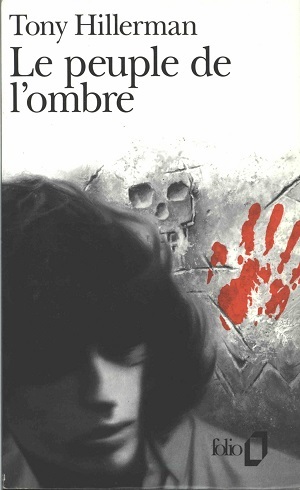 Folio is a subsidiary of the French publishing house Gallimard, who put out a French paperback edition of People of Darkness in 1981. Gallimard, under the Folio name, in 1992 reissued all of Hillerman's novels then available. This edition of People of Darkness, with cover art by Gerard Failly, consists of a photo-montage that has nothing to do with the novel itself, yet the red hand print provides a striking aesthetic contrast to the grey scale wall inscribed with a death head. Format: Paperback, 17.6 x 11 cm.